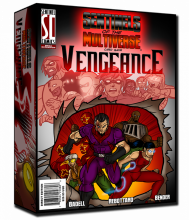 Today I got something in the mail that I’m quite excited about: the Vengeance expansion for Sentinels of the Multiverse. For the unfamiliar, Sentinels is a superhero card game which is neither collectable nor deckbuilding but is instead just awesome. Each hero in the game has a unique deck, along with a special ability, and when you play, everyone picks a hero, and the table picks a villain (who has a deck and abilities) and an environment (which has a deck). No one plays the villain or environment – the decks are basically automated to provide opposition. Obviously, this is basically designed for a multiplicity of combinations – Legacy, Tempest and Tachyon (the heroes) may face Baron Blade in the Ruins of Atlantis and it’ll be a lot of fun, but if you change one element, like the villain or environment, it changes the whole experience. Because this is not a deckbuilder, each deck can have a very distinct feel, wish specific advantages and disadvantages. In fact, some decks are simply harder than others, and the rulebook comes out and says as much. This goes a long way towards keeping the game replayable – it is rewarding to try new heroes and villains, but it’s also rewarding to try to master existing ones. It also makes their expansion model work very smoothly, since each expansion box basically adds some new decks. There is no harm in not having an expansion, and if you do get one, it just integrates into play with no new rules. As an additional bit of cleverness, the unique powers that heroes and villains have are also represented on cards (which, in the case of heroes, look like issue covers) which allows them to occasionally do cool things like print “alternate covers” – hero cards with a different base ability but designed to use the existing deck. There are more cool things about this game than I can easily summarize. The rules for taking out hero allow the player to continue to participate, which is great mechanically. 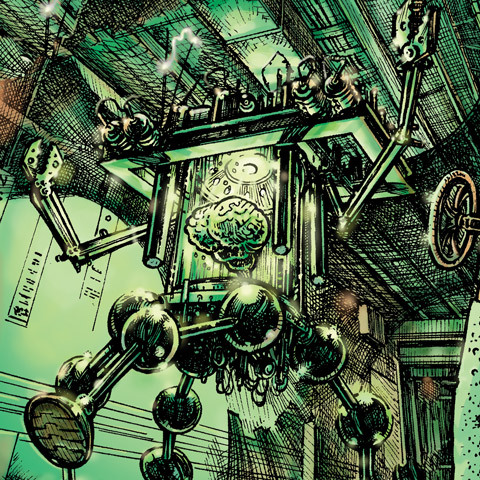 The art is stylized, but consistent, and in a way which shows a deep understanding of comics, an understanding underscores by the comic book “quotes” at the bottom of each hero card. It goes on. My introduction to the game was actually at Pax East. Fred and I had gotten to the game floor early, so we hit the boardgame lending library. I grabbed Sentinels because while I owned the original edition (a precursor to the current Enhanced Edition) I had never played it, and had avoided their kickstarter because I didn’t want to buy a game twice. The new heroes include an archer. That alone would win my love. The box is wonderful. The original Sentinels box was designed for Storage, but mine has been bursting at the seams for a while now. This box is designed for storage with plenty of space to take my overflow and some future expansions. If it’s not obvious, I’m pretty psyched. This entry was posted in Uncategorized on March 13, 2014 by Rob Donoghue. When you play in the new multi-villain mode, make sure you have some heroes that do spread damage. We tried playing against them with the new Vengeance heroes–minus the Sentinels team deck–and they massacred us. Before reading this post I hadn’t heard of Sentinels of the Multiverse, but your description struck a chord and so I ordered a copy. It arrived a few days ago and yesterday my wife, my 4 year old daughter and I sat down to play for the first time. We all had a blast and eagerly look forward to our next opportunity to play. So thanks, I appreciate the tip!